“Only kale can save us now!” reads my favorite t-shirt! And really, is there a green that’s more nutritional? I don’t think so! 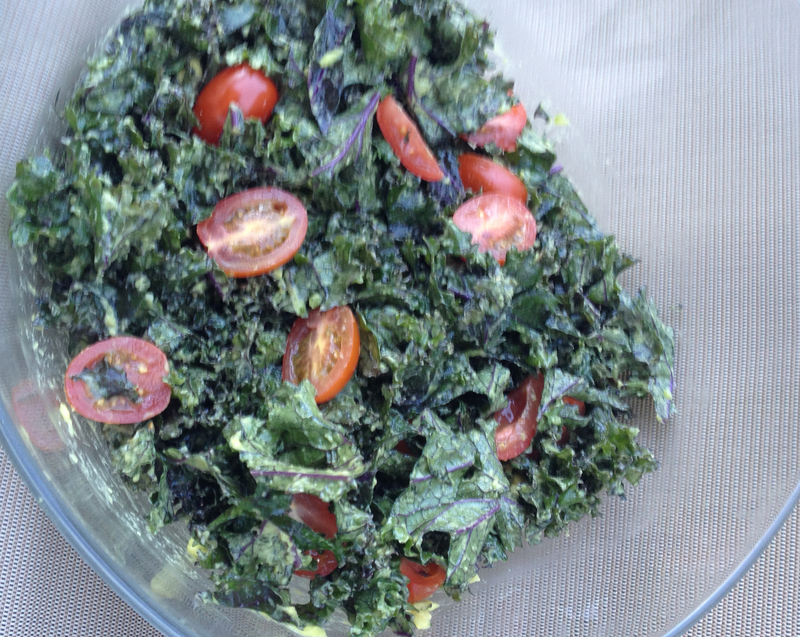 When I started incorporating kale into my green salads I discovered that it broke down just enough to be easily digestible and was even more delicious raw than cooked! Now I can enjoy this powerhouse green year round. Add garlic, avocado and lemon and you have prescription-strength medicine disguised as a delicious gourmet salad! 1Remove stalks from kale and discard. Chop leaves into small pieces and place in mixing bowl. 2Add garlic and avocado. Drizzle with lemon juice and olive oil and, using your fingers, gently massage ingredients into leaves (be sure to mush avocado pieces so they become creamy). 3Add jalapeno and tomatoes and toss. 4Season to taste with sea salt and serve.